So I tried to find a bunch of songs I've been writing down as ones I'd like to have on my iTunes. Unfortunately, none of them are available! What are the chances?! What is the deal?! How can people live without the original "Dirty Deeds Done Dirt Cheap" by AC/DC? What is wrong that the iPopulace doesn't demand the melodious tones of Chesney Hawkes? Can people actually be going without the classical hits Die Fledermaus and Dance of the Sabers? Barbarians! How is a person to survive? This past weekend I saw two movies: "Children of Man" and "Pan's Labyrinth". CoM was a bit of a nail-biter, and the ending was a little weak, but overall very well done. P's L was odd. That's the best phrase I have for it. Combine "Legend" and "Schindler's List" and put it all in Spanish, and you might get something that looks like P's L. Also, on a note to JW, I did in fact go to DSW, and got some freakin' sweet new shoes. Thanks! I can't believe its only Tuesday. Slowest week ever. I guess because things have slowed down at work. Which is good, I need the down time, but its still not helping the days go any faster. Today's links are from the 2003 Detroit Auto Show...mainly because the two coolest vehicles I've seen in the last 10 years were unveiled there. The first is the Dodge Tomahawk. A motorcycle with a Dodge Viper engine. 0 to 60 in 2.5 seconds. Plus it looks like a motorcycle from "Tron" or something. Seriously, paint it blue, give it a dome, and it'd be the thing from Tron. The other is a nice-looking Cadillac. Very slick. And the engine is a V-16. A VEE-SIXTEEN. That's like, 4 of my engines powering ONE car. Anyway, enjoy. Wow, its been awhile since I've blogged, hasn't it? Let's see if I can give the run-down of my holiday goings-on. 1. Christmas! Spent it with the family, which was fun. As usual. I slept a lot. Got a video projector *geeky nerd techie drool* so I can watch all my movies and video games in near-life size. Umm...got some new dress pants, socks, and some Legos, too. All in all, a fun time. I'm still figuring out how to rig the surround sound in my living room. The photo is the sword I have on hold currently with a smith in Texas. Its cool. 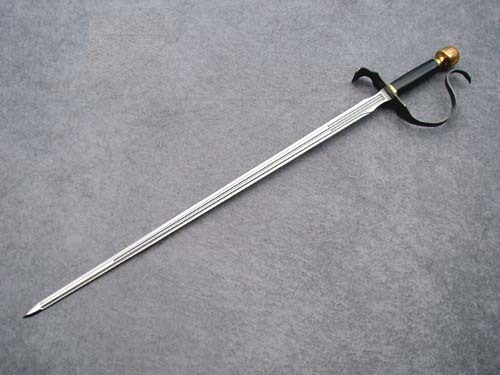 I had originally put a deposit on a sword 3 years ago, but after the post-CK&T distress, couldn't pay the payments, lost the hold on it. Still had a ton of store credit tho. Put it on this baby. Swash swash buckle buckle!